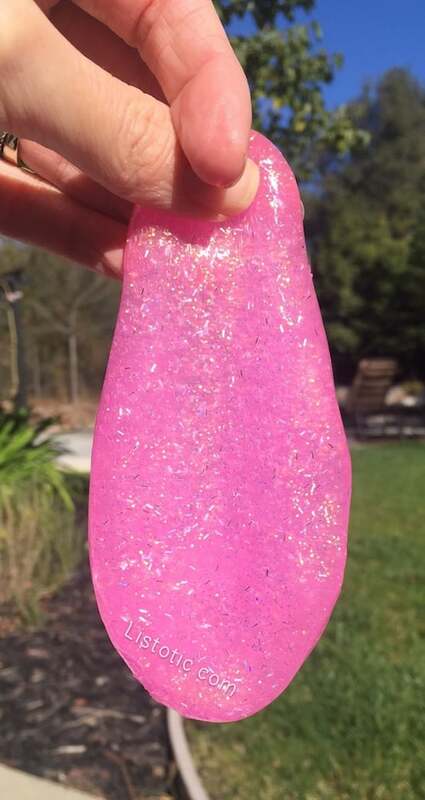 DIY goo, slime, silly putty– whatever you want to call it! Either way, it’s just plain awesome. My daughter is what I would call a “Goo Expert”, and she is the reason why I had to share this easy slime recipe (no borax!). She has experimented with many recipes, and this one seems to be the easiest with the best results. In a bowl or cup, mix together equals parts of Elmer’s glitter glue (or regular glue) and liquid starch, depending on how much you want to make (for example: 1 cup glue and 1 cup liquid starch). I use a plastic spoon to do the initial mixing, and then I use my hands to get the desired texture. At first it will seem sticky and messy, but just keep squishing and kneading it together with your hands. It will take about 5 minutes before the 2 ingredients make their magic. If after 5 minutes or so, the mixture is sticky, add just a touch of liquid starch. If it’s runny, add a touch of glitter glue. You get the idea! Store the slime in an air tight container or it will dry out. You can also use regular Elmer’s glue (clear or white). Mix in a drop or two of food coloring or acrylic craft paint, and maybe a little glitter if you want! If you don’t have liquid starch on hand, laundry detergent or contact solution also works. Save the disposable containers that food is stored in (sour cream, parmesan cheese, deli containers, etc.) to store the goo in. This stuff makes for fun party favors stored in these small disposable cups with lids. My daughter likes to experiment with different colors and then share them with her friends.